Join us on Thursday, April 25th at Scoops in Mountville from 5-8 PM, 15% of the nights sales will go back to our PTO. Thank you! The air conditioner is on full blast in the afternoon in Kindergarten. For both classes, feel free to put a sweater/sweatshirt in their backpack for when our room goes Arctic! I hope everyone had a wonderful spring break and Happy Easter! I can’t wait to see all my peeps tomorrow! PSSA testing resumes Tuesday and Wednesday for grades 3 – 6. No reading groups these two days. Alphabet Countdown begins on Friday, April 26. Every day we will take a letter of the alphabet and do something that begins with that letter. A calendar will come home on Monday. You can also find the calendar at the top on the tab “Alphabet Countdown 2019.” On the copy that gets sent home you will see the days we will celebrate May, June, July, and August birthdays. So much fun and learning for the rest of the school year! In Science we will learn about living and nonliving things, butterflies, and matter! Math we will finish up with 3D shapes and work more with additions and subtraction. Reading we continue our reading groups, sight words, and nonsense words to be ready for May testing. Thursday, April 11: Book Fair BOGOF! Only students prepared to buy books will go to the Book Fair. If you would email or send in a note saying that your child should attend the Book Fair that would be very helpful. A parent/guardian is welcome to come and shop with their child. AM 11:00 – 11:30 PM 1:00-1:30. April 19-22: NO SCHOOL Spring Break! Happy Easter!! We are so glad March went out like a Lamb and we had several days we could run around outside! Now let’s hope April doesn’t bring as many showers so we can continue to get outside for fresh air and fun activities! Your child brought home (or will bring home) the book Splat the Cat, I Scream for Ice Cream as a gift from the class book order. Thank you for your support each month helping us get a book for all of our kindergarteners. Rainbow words: Please go through their baggie of words each night to be ready for testing. Parent helpers come in several times a week to help with writing and sight words. April 8-12 BOGO Book Fair. Our class day to go to the Book Fair is April 11. Only students with money to spend on books will be going to the fair. You are also welcome to come in that day to shop with your child. AM: 11:00 – 11:30, PM: 1:00 – 1:30. Tomorrow, Thursday, March 28, the AM class will have a class reward. They have picked to watch a movie, bring a blanket or stuffed animal, and a snack (I will provide the snack) The stuffed animal OR blanket (not both) need to be able to fit into a backpack. 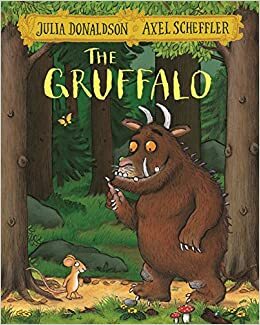 We will watch the movie The Gruffalo and talk about the rhyming words and parts of the movie such as setting, characters, the lesson/moral of the story, and how we can make connections to ourselves, other movies or books, and the world around us.